Time of paper airplanes is long gone and we have new players in town – drones! Summer is coming and drones are getting a massive boost in sales. It seems as though, after 2016 summer, they are back into play with a well-deserved sales growth. Surely, drones will soon be seen shining their props and polishing their brushed motors, just waiting in line to be picked up. So if, for any reason, you’d like to reminisce to the old summer days and the smell of paper being molded into airplanes, buying a drone might be the best thing about this summer. It’s not the same thing, I know… but that’s sort of a beauty to it. Whether you’re going to share your summer with your loved ones or your children, drones are able to capture the very essence of your most beautiful moments together. That’s why, we have decided to analyzed drone sales charts during the first week of June and are back with interesting insight. Unsurprisingly, high-end DJI models are still breaking the records. With the Spark announcement, DJI currently holds all 3 top spots. The bottom two models, on the other hand, are actually quite surprising. None of them is by Yuneec which shows just how much they’re struggling at the moment. 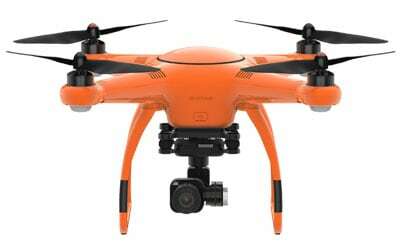 At #5 spot, we have Hubsan H501S, a model that has managed to squeeze out Yuneec Q500 out of this list. How did it manage to do so? Well, for starters – it sits on a much better price point and is capable of delivering pretty much the same experience as Yuneec Q500. Luckily, potential buyers were quick to realize that and are rapidly beginning to swarm. Starting off at the spec sheet, Hubsan H501S seems rather impressive. Flight time hovers around 20-minute mark which is excellent. Even more so considering it runs on a 7.4V 2700mAh LiPo. But, it is not a big drone so that partially explains the flight time. Range is somewhat of a sore spot. Even though it’s not too short, we are talking about roughly 300 meters here, there is definitely room for improvement with future installments. Perhaps an upgraded version of some sort. Currently, short range is number 1 downside for most users so I’m not talking nonsense here. On the bright side, features section is nothing short of amazing. With GPS, follow me and one key return to home features, Hubsan H501S already has everything it needs (and more). Even going one step further, it sports OSD live data and altitude hold topped off with enjoyable FPV experience. Camera is good as well. It can record full HD videos and take gorgeous aerial photos with little to no jelly effect. For this price, I am sure you cannot get your hands on anything better than this. It provides awfully lot of value for money and deserves to be a hit this summer! For too long, Autel Robotics X-Star Premium was a heavily underrated drone. It had everything a proper high-end drone needs to have, but sales just weren’t good enough. Finally, it has reached better days; finally, customers noticed its real quality; finally, it is standing where it always should have – at the very top. Since this is a drone who has aerial photography as a primary aspect, it is only fair to start off with the camera. We are talking about a 12MP sensor capable of recording in 4K at 30fps. 3-axis gimbal is present as well, which is not that surprising after all. In terms of FPV, X-Star Premium sits comfortably at 1.2 miles (roughly 2 kilometers). Unfortunately, if you plan on using FPV goggles on it, you’re in for a rough time. To save you a ton of stress, here’s the quickest way to get FPV goggles working on Autel Robotics X-Star Premium – get Nvidia Shield K1 tablet. This is, by far, the easiest option out there. Features are always an important aspect Luckily, Autel Robotics did not fail to deliver. With GPS/GLONASS support, SecureFly magnetic interference protection and a built-in LCD display on the controller, X-Star Premium looks to be all set. Combine that with several smart modes and battery life of 25 minutes and you’ll begin to understand why it deserves to be at the top. As I’ve mentioned in the introductory paragraph, all 3 top spots belong do DJI drones. We are starting off with what was planned to be their best-selling drone – Phantom 4 Pro. This powerful flagship model is the pinnacle of modern-day drone tech… but was still beaten by 2 other models. The reason is not P4 Pro’s technical inferiority rather than needs of potential buyers. Most people don’t need such a powerful, bulky and overly priced model. They’re satisfied with smaller models that don’t cost as much but have exceptional build quality and specifications. And that’s exactly what took DJI Phantom 4 Pro off the number one spot – size/performance ratio. Despite that, it is still selling amazingly. Even though casual users are starting to steer away from it, DJI Phantom 4 Pro has managed to keep its rank with commercial users. With specifications being 27 minutes and 7 kilometers (battery life and range), it’s clear to see why it’s such a good choice for non-casual side of market. 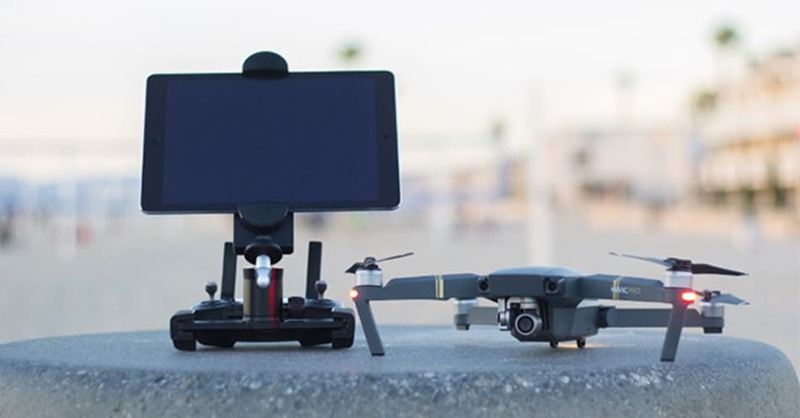 Features are on point too – full support for DJI GO app, easy FPV goggles setup as well as compatibility for thermal cameras are all going in P4 Pro’s favor. But, let’s not forget about its awesome camera! As some of you might know, it’s the first drone to have a 1-inch 20MP image sensor. Obviously, it can record in 4K at buttery 60FPS with H.264 encoding. Needless to say, video and image quality are the best on the market, not even getting trampled down by third party cameras such as Gopros. All in all, DJI Phantom 4 Pro might have lost the top spot but has managed to keep its flair. If you missed it, DJI has just recently announced a brand-new drone – the Spark. Needless to say, it was an outright shock for many as most of us expected they’ll announce Mavic Pro 2. 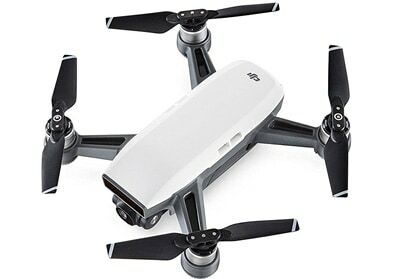 Even though Mavic Pro was a champ when it came to size/performance ratio, people thought it was too big for a foldable drone and wanted the 2 to be much smaller. Perhaps DJI took their wishes into account and created Spark as the spiritual successor? Well, whatever it might be, one thing is certain – DJI Spark looks amazing! It is incredibly small (exact proportions are 143×143×55 mm), roughly the same size as a soda can. Such a small size factor makes it a direct competitor of heavily popular selfie drones such as Yuneec Breeze and Zerotech Dobby; something which DJI planned would be the case with Mavic Pro, but it wasn’t the case. Despite its size, we are still talking about a mighty drone. With a FHD camera, 15 minutes of flight time and range of roughly 2 kilometers (when paired with its dedicated controller), Spark is smashing the ground with competitors. Features are nothing short of brilliant either. With a wide array of smart flight modes and tracking software, it also posseses 2 brand new features. They’re called PalmControl and PalmLaunch. Both of them, you’ve guessed it, have something to do with your palm. As a matter of fact, both are rather self-explanatory – latter lets you launch from your palm while first one lets you take control solely with your hands. So, with charming new features and solid specs, DJI Spark might become the best drone in summer 2017. And the most popular drone in June is, expectedly, DJI Mavic Pro. This amazing drone has broken all records in terms of sales and general popularity. It has surpassed Phantom 4 and even Phantom 4 Pro when it comes to unique purchases which just proves its superiority. But why do people love this drone so much? Well, it’s mostly because it delivers excellent all-around performance and comes with no strings attached size-wise. It’s foldable, amazingly compact and can be carried with you anywhere you go. It’s the best travelling buddy for sure, even on airplanes. Simply fold it up, put it in its case or together with your laptop in carry-on luggage and you’re good to go. In terms of performance and main specifications, Mavic Pro is head to head with Phantom 4. With cca 25 minutes of battery life and 7 kilometers of range, it is obviously miles ahead of its direct competition. Camera is on the same level as well. It can record in 4K and sports an incredible sensor that picks up a lot of light for great photos and videos. Feature-wise, Mavic Pro sports several smart flight modes including TapFly and ActiveTrack. Also, there is full DJI GO app support that’ll make your tasks much easier to handle. Is that enough modern-day paper airplanes for one month? Do you want more? Well, unfortunately, that’s about it when it comes to June. But, don’t despair if you haven’t found the perfect drone for you in the list above. There is dozen other lists on DronesGlobe. One of them will surely provide with your dream drone.